Following the 1st part of bootloader description for ULPNode this article describe what modification have been done to optiboot to be able to drive new Ultra Low Power nodes. For this, I started from original optiboot (latest trunk from google code) which is version 6.2 at the time of writing. The process to build the bootloader is quite simple and the organization of the files are very well done so that we can implement customization without touching too much original files (except the optiboot.c source file of course). I created a ulpnode folder under the Arduino bootloaders setup folder (mine is located in Arduino-Install-Dir\hardware\arduino\bootloaders\ulpnode\) and put all necessary files into this folder. # this is for ISP, did not test, not sure this part is working. Hummm, I can hear some readers asking what are these fancy frequency 4MHz and 250Kbps baud rate ?? 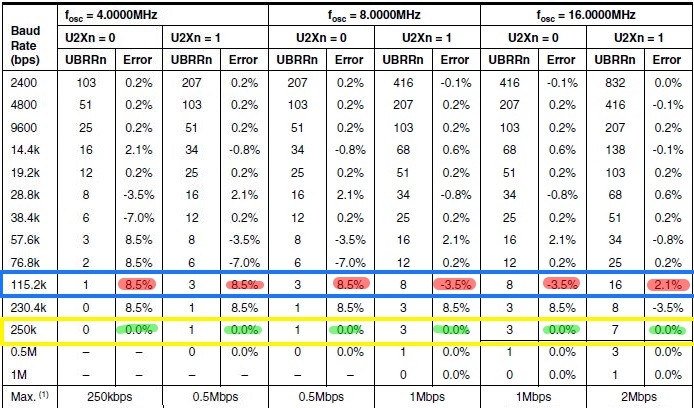 Well the 4MHz frequency is explained in the 1st article (just because ULPNode is running at 4MHz to be able to run until 1.8V) but the 250Kbps isn’t. But looking closer at the datasheet you will find that at 250 000 kbps you always have 0% error. Amazing, since all USB/FTDI chips used to upload sketch are able to do this speed I’m still wondering why it’s not used. I have all my Arduino board flashed with 250 000 kbps uploading. The drawback is that Arduino IDE does not permit Serial monitor to work at this speed even if the serial port is capable of. You can always in your sketch use a Serial.begin(115200); configuration, but once again, at 4MHz this will not work, so using Arduino serial monitor should be setup with 38 400 kbps. If you want to serial monitor at 250 000 kbps, you will need to use other tool such as putty. Of course you can stay on the well known speed, for 4MHz, but you will need to upload at 38 400 kbps. It works, uploading is just slower. I’ve tested a workaround, compiling bootloader for 16MHz and just before upload, set clock prescaler to 1 to use 16MHz speed, this is working fine, so why I did not used this technique ? 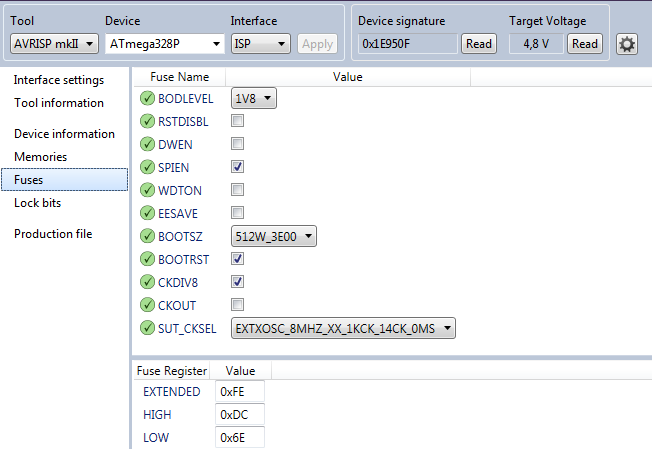 Because the WS2812B led driver is included onto the bootloader. This driver code is compiled for a specific speed (and it’s very time critical) and I wanted ULPNode able to light the LED when running at 4MHz (it normal speed) without the need to go to 16MHz speed just to light LED. 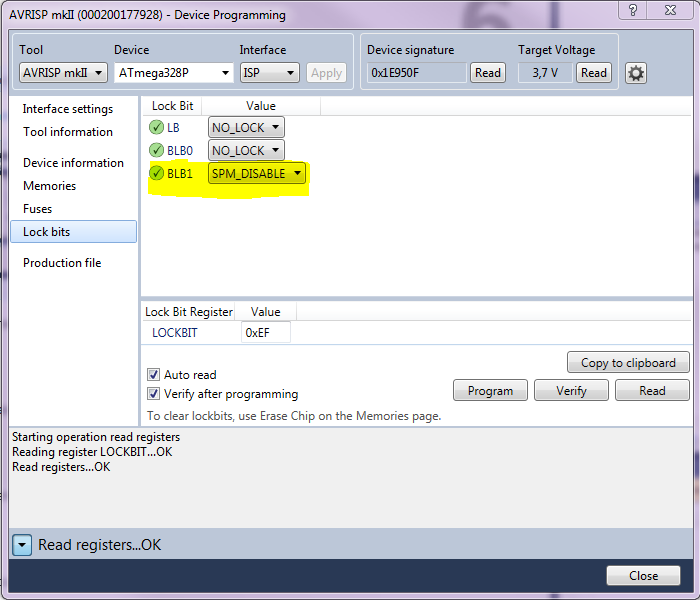 And as the WS2812B driver code is shared between bootloader and sketch, when called, both need to be at 4MHz. I privileged ULPNode LED code instead of the bootloader one, but it’s just an arbitrary choice that you can change depending on your need. What is changed on bootloading view ? This order is subject to change depending on more testing. I need to test and tweak this with the real ULPNode boards. Of course for the example flashing the LED 3 times is not Low Power even if it’s not at full brightness.It’s fine for testing but for example you could blink 3 times when connected with FTDI powering the board, 1 time only when Wake Up switch is pressed, and no flash if none of the above is happening. Once fuse are programmed flash the hex file and you’re done. Once again I’m using AVR Studio for this. If all went fine and have a FTDI connected to your board, you should see 3 purple flashes on the WS2812B LED as soon as flash is finished or if you reset your board. I faced some problems during testing when programing large sketch that were uploading data over the bootloader code and thus erased the bootloader code. This even if arduino IDE said that the code size was not “too big”. I opened a thread on Arduino forum about this issue. If you have now your bootloader compiled and flashed, you should be able to upload sketch to ULPNode. If you kept the ULPNode default configuration and didn’t changed the frequency or baud rate, you certainly want to upload a sketch but remember that this board works at 4MHz with 250 000 kbps. No board of this type exist on the Arduino IDE, so we need to declare it. It’s quite simple just add the following section to the boards.txt file located into your Arduino Installation (mine is located in Arduino-Install-Dir\hardware\arduino\). Then restart Arduino IDE, you just need to select the new board type ULPNode 4MHz (250K upload) and flash your sketch. Do not forget that at 4MHz you won’t be able to serial console at 115 200 kbps. Use 38 400 kbps from Arduino IDE (but upload still goes at 250 000 kbps). I’ve also added a 16MHz version in case you want to use ULPNode as classic “Arduino” but with upload up to 250 kbps. How declare bootloader function as exportable to sketch ? To be able to call a function located into the bootloader section, we need to know the address of the function and do a call to this function. To obtain the function address, the basic and weird way is to take a look to the .lst file generated when compiled the bootloader, and, put this address in you sketch. Here is an example, the function to light the WS2812B led is called __bl_showLED found in the generated .lst file. You can see that the function address is identified at 0x7eea by the line 00007eea <__bl_showLED>: . But this is not really convenient since each modification on the bootloader code could change this address and you will need to report back this change in your sketch code. Any tip to avoid this ? Sure !, the idea is to put on the bootloader area a mapping table with the addresses of the functions to export. And set this area on a well know defined address. Here I choose to place this table just before the optiboot version number, at the end of the flash area. The optiboot version number is two bytes located at the end of the flash area, at address 0x7ffe/0x7ffff. Our function table will be located on a new section starting at 0x7ff0 to 0x7ffd which let us to put 7 functions addresses (one address is two bytes). Adding a section for compiler and linker is an easy and convenient way to reserve this space. I just added -Wl,--section-start=.functable=0x7ff0 to define our section .functable. Now, for this to be working I also needed to add the following file to the Makefile.ulpnode. If it was not done it was not working (but compiled fine). Don’t ask me why, I duplicated the job done by optiboot to the section .version, may be related to the linker to create and allocate this space. If someone knows, it would be nice to tell me what it really does. As you can see, there is no function prototype defined in the .functable section, only the function address, the prototype will be defined in the sketch file. But how to call the exported function from sketch ? To call the bootloader function to light WS2812B onboard LED, we just need to declare the address of the function table, read the address of the function from the table and define the function prototype pointing to this address. For this, we use the macro pgm_read_word that I included in a more friendly macro called __BL_FUNCTION_ADDRESS with the number of the function we need to retrieve (1 for the 1st declared in optiboot.c and so on). Then we need to call the the macro __BL_FUNCTION_ADDRESS(1) to get the address of the 1st function located in bootloader table. Here it is what you’re sketch could look. The above sketch will blink the WS2812B led in purple every second. You can see full sketch on github repo. This is the end of this quite long article. I hope you found this article interesting. It’s the last concerning the bootloader stuff for ULPNode. It has been made for ULPNode but I think you can easily use it for any kind of Arduino board by tweaking the configuration parameters. It can be a good starting point. 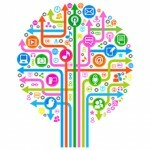 If you find any bugs, a better implementation or just add some features, just drop me a comment or better open a topic on the ULPNode forum.